Hundreds of voters found out their views are Libertarian-leaning when they stopped by the Libertarian Party of Orange County’s (LPOC) booth at the annual International Street Fair at the Orange Circle, in Orange, this LAbor Day weekend. LPOC Chairman Tom Hanson was at the booth on Sunday, all day long. He never lost enthusiasm even as he and his fellow Libertarian Party volunteers baked in the heat. 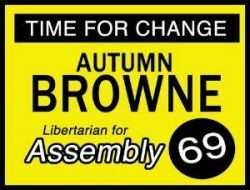 His mission was to educate Orange County voters about the Libertarian Party and the LP’s presidential ticket – former New Mexico Governor Gary Johnson and internationally renowned drug reformer Judge Jim Gray – who resides here in Orange County, in Newport Beach. Over 100 voters committed to Johnson this weekend when they heard that, as a former Governor of New Mexico, he slashed taxes 14 times – and left behind a billion dollar surplus in the state’s treasury. And dozens of voters swtiched to the Libertarian Party – particularly Republicans fed up with the GOP after the way the red party treated Ron Paul and his supporters at their Tampa Bay conference. Hanson was more than happy to welcome the disaffected Republicans. He pointed out time and again that GOP presidential nominee Mitt Romney would have to pickup five million Democratic voters in order to beat Barack Obama in California. That is not going to happen – so why not vote for Johnson and punish the Republicans for nominating a lame candidate in Romney? The results of the political quiz that the voters took at the LPOC’s booth were astounding. Hanson noted the results on a large board (seen in the picture above). There were very few “conservative” voters. Most of those who took the quiz found themselves somewhere in the middle – and to their surprise they found out they agreed with Libertarian Party views. As one might have expected, a few crazed Republicans showed up as well – and the Romney fans could not be dissuaded by any means. They have tickets on the Titanic and they intend to go down with the ship. Their number included Orange mayoral candidate Jon Dumitru (pictured above).